What I bring to this book is a global architect’s perspective and practical experiences both abroad and in Japan. In my first chapter, I get into the detailed countermeasures taken in Japan to guard against disasters such as earthquakes and fires so that you can judge any potential threat to your investment properly. I’ll tell you what those countermeasures are, how they developed, and what you should look for. 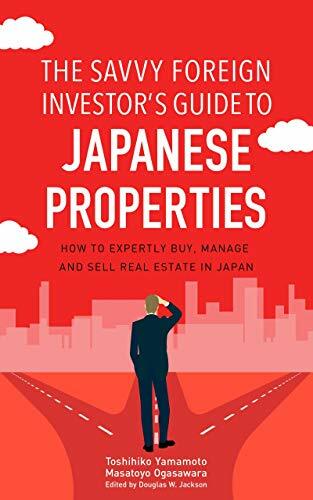 My second chapter tells you how to find a top architectural firm in Japan and the most effective ways of interacting with them, how to ensure you have the right contractor and get your property built or renovated to your satisfaction, and what pitfalls to watch out for along the way. Some of the issues I get into are how communication styles differ between Japan and the rest of the world, project logistics and who controls them, and other aspects. I also provide a few case histories about clients my firm has worked with, and what we do to ensure ultimate satisfaction. About my professional background: I’m a U.S.–trained architect who specializes in high-end architecture, both residential and commercial, and the founder of Masatoyo Ogasawara Architects (https://masatoyo.com/en/projects/), an architectural firm in Tokyo. I’m both a registered architect in the State of New York and a first-class architect in Japan. After graduating from the University of Tokyo with dual degrees in aeronautics and architecture, I attended the Harvard University Graduate School of Design, and then moved to New York to join the well-established firm of Pei Cobb Freed & Partners. I acquired many skills as a professional at Pei Cobb Fried, surrounded by seasoned architects who worked on high-profile projects with Pritzker prizewinner I. M. Pei such as the Grand Louvre modernization (the glass pyramid in Paris), National Gallery East Wing in Washington, DC and the Bank of China in Hong Kong. This experience gave me access to and knowledge about top-class materials and construction details, and also provided me the chance to deal with high-end international clients. After four years at Pei Cobb Fried, I came back to Japan to pursue professional excellence and seek out opportunities to be the lead architect on projects. I also earned my doctoral degree in engineering in fall 2017 from the University of Tokyo. My firm has a proven track record of providing aesthetically elegant and technologically efficient buildings and houses. Our clientele are diverse, including a European company, an Asian billionaire, a Chinese business owner and others. It is noteworthy that our clients are predominantly non-Japanese who own properties in Japan. My firm provides world-class, high-end and diversified services in English (and I also speak a bit of Mandarin) in Tokyo. We welcome your inquiries on projects already in progress or upcoming.